January 2013 felt new. There were long days at work, but I ran a race and got my car serviced, went line dancing and knitted a scarf that only just makes it round my neck (but which, of course, I love). I played violin in a bar with a songstress friend, and cooked dinner parties out of Jerusalem and Sunday Suppers at Lucques. I got bangs. I joined instagram. I did not, however, write a blog post. The work-play balance is a subject beyond the scope of a few paragraphs, but it’s hard to power down at the end of the week – and harder still to sink into that free time without thoughts of the books you should be reading, the current events in which you should be well-versed. I heard somewhere recently that in your twenties you aren’t particularly humble, and seen from that vantage point I don’t suppose I am – I want to work eight hours, master Keynote, pay off my loans, go for a run, cook a meal with strange ingredients, and knit my funny little scarf. That and, well, write about it. Unfortunately, I also want to lie in my deckchair all Saturday and do nothing. The list is there – email subjects bold and accusing, bangs swept in a headband and desperate to be trimmed – but the deckchair, the bathtub, the towel on the beach just won’t be resisted. I used to feel guilty about this urge towards nothing. Then I realized it takes a certain humility to lie in the sun without so much as a magazine in sight. So perhaps I’m more humble – or maybe I’m just a bit more lazy. Either way, I do know that on the totem pole of To-Do’s my blog should probably come before the scarf. Just maybe not before a nice long bath. 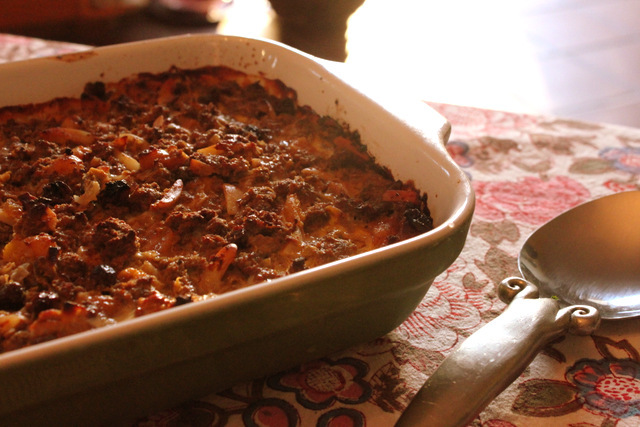 Yes, this is not the first bobotie recipe I’ve posted on my blog. 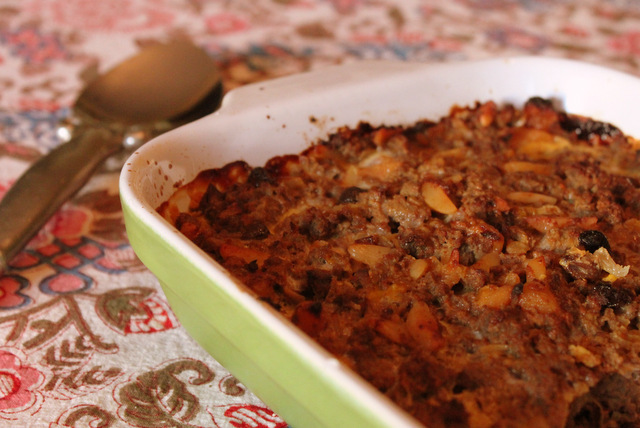 But I present this updated, improved version for two reasons: firstly, because bobotie is my go-to comfort food in wintry moments (if relatively unknown outside of South Africa), and more importantly, because it goes wonderfully with a wine I like very much. I had lots of fun doing a wine pairing recipe for Cimarone Estate Wines last spring, so when they reached out to me about their 3CV Syrah I jumped at the chance – especially since it meant pairing an old favorite with a new one. Preheat the oven to 400 degrees. In a small bowl soak the bread in the milk until soft, then gently wring out the bread (reserving leftover milk) and crumble into a large bowl. Mix the bread with the ground meat and 2 Tbs of the curry powder. In a large skillet or pot, saute the onions, garlic, ginger, and coriander in olive oil until translucent. Add the meat mixture and stir until the meat is nicely browned, then add the apricots, raisins, almonds, half of the reserved milk and one egg. Season with salt and pepper. Transfer the mixture to a baking dish, then beat the remaining 2 eggs with the other half of the reserved milk and the 1/2 Tbs curry powder and pour over the top of the meat. Bake in the oven until the egg mixture on top is browned, about 30 minutes. Serve with turmeric rice and liberal amounts of chutney. There’s nothing like handing out Halloween candy to kids in your old neighborhood to make you feel like a grown-up. Home alone with a giant bowl of Kit Kats and a half-buffered stream of my favorite sitcom, it seemed I’d skipped my twenties and landed squarely in old age. So I threw in the towel and made scones. And, to be honest, indulged in a little food philosophizing. I mentioned the idea of “good food” in my last post, and it turns out that’s a bit of a topic at the moment (at least if you are, as I am, a shameless slave to New York Times op-eds). But while food can taste good, it can’t be good. Food isn’t moral in that way, because then we’d be expecting it to fill hungers it can’t. The truth is, you can’t grow a great tomato in a hothouse. The truth is also that genetically modified crops feed farmers and their families who would otherwise starve when ordinary seeds wither in droughts that worsen every year. But when we talk about what food can give us beyond mere nutrition (which is important – we’d die without it) we’re really talking about ritual. 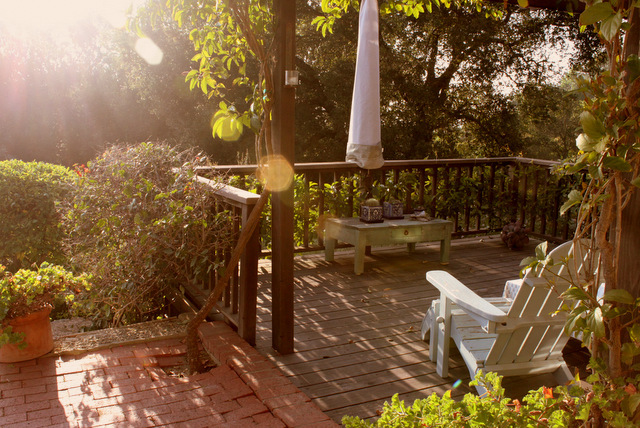 Yes, I love walking into my parent’s garden and eating warm figs straight off the tree every morning in summer. But I also loved Thursday nights at JJ’s Place and their suspiciously frothy fro-yo. I loved bottles of Lagunitas IPA on the farm, and driving with my college boyfriend’s mom to Chick-fil-A. I love my family’s flaming Christmas pudding every year on Christmas Eve, and a pot of Five Roses every three hours with my dad when we’re both working from home. It pains me to say it, but I might even be looking forward to gingerbread lattes. It’s the ritual that gives meaning to the food, not the food that somehow gives us meaning. That’s why we eat those awful frosted, lettered cakes at birthdays and graduations, and that’s why we take communion. Food tastes wonderful and keeps us alive, but whether you’re a maize farmer in Tanzania or a silly food philosophizer like me, it’s the ritual associated with food that truly makes it meaningful. 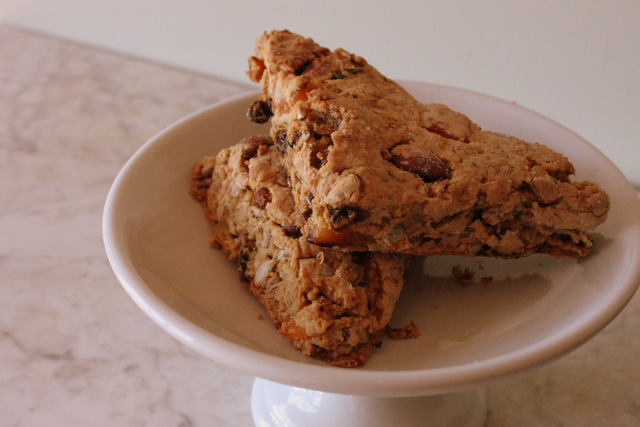 I adapted the recipe for these scones and always encourage substitutions – I love almonds and dried apricots in everything from sweets to curries, but feel free to use whatever trail mix mix-ins your pantry offers. Heat oven to 350 degrees. Place raisins and apricots in a bowl and cover with boiling water. Soak for 5-10 minutes, then drain and set aside. In a large bowl, combine flours, baking powder, baking soda, salt, brown sugar and oats. Cut butter into small pieces and rub into dry ingredients with your fingers (trust me – this step is key for that delicious flakiness). 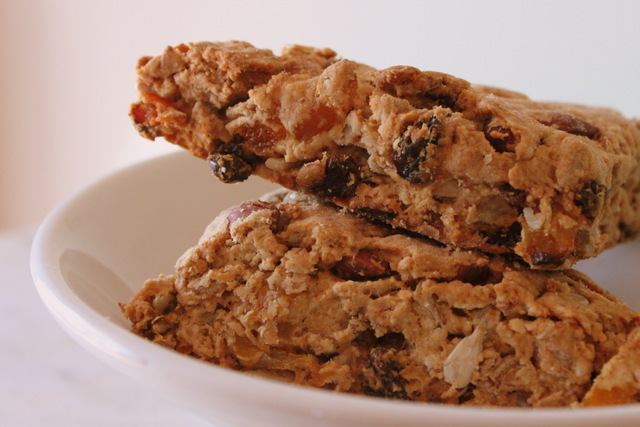 Stir in dried fruit, almonds and sunflower seeds, then add yogurt. Add the milk a little bit at a time (using more if necessary) until you have a dough that just holds together. Place dough on a floured surface and shape into a square that’s one inch thick. Cut the dough into squares and then triangles (you can make them smaller if you’d like), then place scones on cookie sheets and bake for 25-30 minutes.